orey, a visual folklorist, is available for talks to discuss the unique techniques he uses when shooting mysterious and haunting pictures of Victorian mansions and cemeteries. Using a Power Point presentation, Corey also shares tales of the amazing adventures he and his wife have experienced during their travels while capturing the legends and folklore of these haunted places. He is an engaging speaker, who appreciates audience questions and dialog about the works and associated legends. 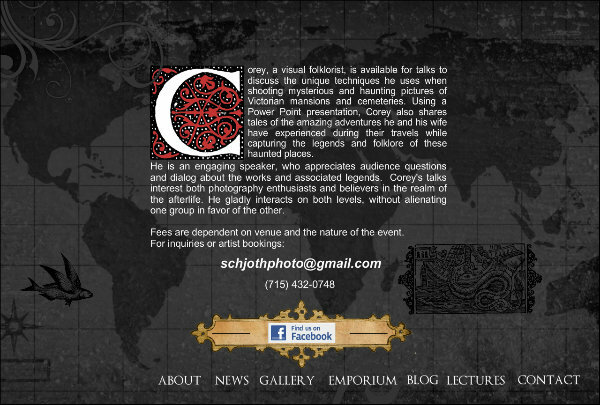 Corey's talks interest both photography enthusiasts and believers in the realm of the afterlife. He gladly interacts on both levels, without alienating one group in favor of the other. Fees are dependent on venue and the nature of the event.